I think I made a promise to do this blog daily when I started. Well, that’s the beauty of being Over 50, I can do what I want and not feel guilty about it. I could say I was busy, and I was, but that’s not really why I haven’t been here. It’s just that my super ego has shrunk and my guilt has subsided. This morning I heard that freshmen entering college right now were just starting kindergarten when the 9/11 attacks happened. When I first thought about it, I thought “Man, I’m old.” But then I realized, I’m not old, it’s Time that moves too fast. I certainly don’t feel old. And many things in the past don’t seem that far away, while others feel like eons. It’s perspective, I suppose. Take black lacquer furniture from the 80s. That’s what was going on when I started college. And yet, it doesn’t seem that long ago. 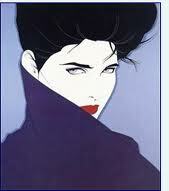 I suspect someone somewhere still has Patrick Nagel print hanging on their wall. Probably some therapist’s office.